Here is a look at one of the greatest Christian’s in history, Saint Augustine. Saint Augustine or Augustine of Hippo (354-430), was nothing like a saint when he was young, probably like most of us, but this man is regarded as perhaps the greatest thinker, philosopher and theologian in the first one thousand years of the church. Jerome said that Augustine had breathed fresh air into the ancient faith and made it like new again, as it was in the apostle’s day. Augustine may have been the greatest Christian thinker of his day, and perhaps since the Apostle Paul, who himself may have had no equal in his day. Augustine’s “Confession” and “City of God” have shaped our Christian thinking even today, and these are still considered to be classics. Augustine’s exegesis of Scripture laid a foundation for the coming medieval and contemporary Christian thought, however, in the beginning it would have seemed highly unlikely, because Augustine grew up with parents that were by no means wealthy. He was born and raised in Thagaste, located in the modern day city of Souk Ahras, Algeria, but he had to borrow a lot of money to complete a first class education, and so went on to study at Thagaste until he went to Carthage. It was there, in that great African city in Roman Africa, that he learned rhetoric, and that changed his life…but it also changed history. When Augustine traveled to Rome with his newly acquired skills in rhetoric, he practically fell into one of the best jobs he could’ve ever hoped for. He was hired as imperial professor of rhetoric at Milan (Italy). It was one of the most prestigious positions in society, but something was wrong. He wasn’t fulfilled. After two years of teaching, he quit and returned to his hometown of Thagaste. It was only by God’s divine providence that Augustine was somehow forced into being the junior clergyman at Hippo, a coastal city just off the coast of Thagaste. I would mark the time before Augustine became “Saint Augustine” as BC or Before Christ, because like many of us who were not saved, we lived lives that were deserving of the wrath of God. All that we and Augustine were doing was “storing up wrath for yourself on the day of wrath when God’s righteous judgment will be revealed” (Rom 2:5). Augustine ignored his mother’s advice to marry the girl he had been seeing, instead, he had a 15-year affair with her, along with an illegitimate son, however in the Roman society in which he lived, this wasn’t even the least bit scandalous[2.] Interestingly, Augustine’s studies of the philosophies of the world, which were diametrically opposed to Christianity, actually brought him closer to Christianity. It was in the process of studying these different philosophies of the world that he began to move closer and closer to the knowledge of God. In an ironic way, Augustine was not influenced by Christianity, at least at first, but his influence on Christianity would be indelible, and would forever leave its mark. Some people have been given great skills and abilities, others have developed them, and all Christians have been gifted supernaturally (gifts of the Spirit), but Augustine broke the mold, having all three! No human next to the Apostle Paul could have defined and defended Christianity as good as Augustine did. He was able to articulate to the church and his opponents, the philosophical and rational reasons that Christianity is the one, true religion to which we can have access to God, thereby allowing us to enter the City of God. When Augustine became Bishop of Hippo in 395 or 396, he held that office until the day he died (430), and during that time, Saint Augustine was able to cement the still-young church upon a solid foundation upon which it could stand by expressing applicable ways to understand the Bible. He was able to express in words what many other Christian leaders of the day could not, and this allowed the church leaders and lay people to keep to the center the church and fixed upon the Rock. Augustine contended for the faith that was once delivered (Jude 1:3) like none had done since Paul’s day. Augustine was aware that “certain people have crept in unnoticed who long ago were designated for this condemnation, ungodly people, who pervert the grace of our God into sensuality and deny our only Master and Lord, Jesus Christ” (Jude 1:4-5). That’s why he destroyed the arguments of Pelagius, and his followers, who believed that original sin did not taint human nature and that mortal will is still capable of choosing good or evil without special revelation or action from God. This belief is called Pelagianism, and Augustine knew it was contrary to the biblical doctrine of the free gift of God’s grace (Eph 2:8). It was God’s initiating our salvation and completing our salvation, not we who came seeking after Him, thereby contributing to our salvation. Augustine argued from Scripture that we are not capable of choosing good (Eph 2:1) or seeking after God (Rom 3:10-12). This is why Augustine’s appearance in church history is so crucial. It kept the church grounded in the faith once delivered. 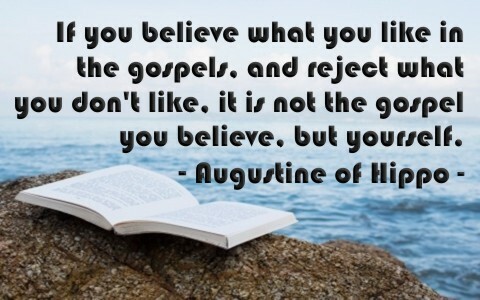 Few would argue that Saint Augustine or Augustine of Hippo, was the most influential man in Christendom, and his writings, next to the Holy Scriptures themselves, impacted Christianity like nothing else ever had. Augustine’s “Summa Theologica” was often used by Martin Luther and John Calvin as part of their defense for standing by the essentials of the faith, like “Scripture alone” (Sola Scriptura) is our only authority. Saint Thomas Aquinas quoted the works of Augustine throughout his writings, but it all began when Augustine was spending time in a garden where he was contemplating his overwhelming guilt about the immoral lifestyle he was living. It was at this very moment that it is said a girl’s voice chanted, “take up and read.” The next thing you know, Augustine is reading from Romans 13:13–14 and the power that is found in the gospel of salvation (Rom 1:16; 1st Cor 1:18) is unleashed. This causes Augustine to put his faith in Christ. And of course, that changed history. Something more to read: Are Christians Saints? Resources – Scripture quotations are from The Holy Bible, English Standard Version® (ESV®), Crossway Bibles. (2007). ESV: Study Bible : English standard version. Wheaton, Ill: Crossway Bibles. Used by permission. All rights reserved. Jerome wrote to Augustine in 418: “You are known throughout the world; Catholics honor and esteem you as the one who has established anew the ancient Faith” (conditor antiquae rursum fidei). Cf. Epistola 195; TeSelle, Eugene (1970). Augustine the Theologian. London. p. 343. ISBN 0-223-97728-4. March 2002 edition: ISBN 1-57910-918-7. (Accessed, Jan 26, 2017). Ranke-Heineman, Uta (1988). Eunuchs for the Kingdom of Heaven: Women, Sexuality and the Catholic Church. US: Penguin Books. ISBN 9780385265270. (Accessed, Jan 26, 2017). Previous post: What Is The Sin Of Gluttony? Next post: Why Does God Allow Tares In The Church?